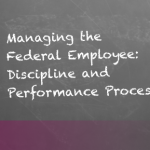 One of the things we regularly talk about in our seminar, Managing the Federal Employee Discipline and Performance Process, is the importance of supervisors giving authentic, honest, and constructive feedback to employees on their performance or conduct issues. In our classes we teach the H- E- A- D- model to help supervisors successfully give constructive employee feedback. Finish the job with Documentation. Now you can use our model to spread a little kindness by embracing Rockwell’s Kind Candor.